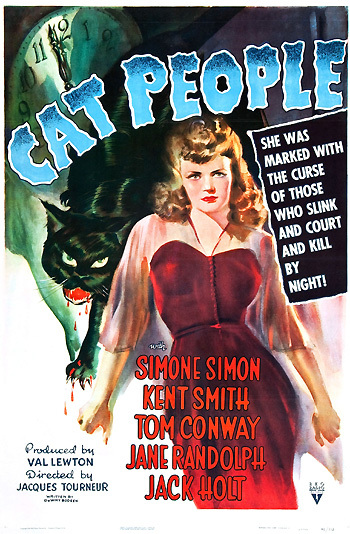 Cat People (1942) is a low-budget horror classic from RKO Radio Pictures, Inc. - the haunting, low-key story of the difficulties of a foreign-born immigrant sketch artist and young bride (Simon) in an unconsummated marriage, especially her victimization and torment by menacing fears of the supernatural and unknown. It is often hinted that she is sexually frigid and according to legend, she may be stained through heredity by being a descendant of a certain Serbian tribe. Emotional arousal or jealousy may literally (and metaphorically) turn her into a lethal, animalistic killing force that may devour its male prey. The atmospheric, suspenseful B-film tale with expressionistic, film noirish photography (by Nicholas Musuraca) was effectively directed by Jacques Tourneur and produced by Russian-born Val Lewton - it was the first in a series of chillingly suggestive films in which Lewton would play upon unseen horrors and draw upon viewers' imaginations. (In two scenes toward the film's climax, the studio almost destroyed the mood established by the entire film by insisting that the actual creature be shown.) Neither Tourneur or Lewton ever received an Academy Award nomination for their evocative works. The moody, early 1940s film, with a screenplay by DeWitt Bodeen, was one of the first to make an explicit link between horror and female sexuality, something that has since become a staple of modern-day horror films. An unsubtle, erotically-sexualized and violent remake-sequel of the same name by screenwriter/director Paul Schrader in 1982 starred Nastassja Kinski as the bewildered woman who is metamorphosized into a black panther when sexually aroused. WHO SLINK AND COURT AND KILL BY NIGHT! NO OTHER WOMAN COULD EVER FEEL! Although most of the film was shot at RKO/Radio Pictures studios in Hollywood on a shoestring budget ($134,000) in less than a month, the famous swimming pool scene was shot at a hotel in the Alvarado district of Los Angeles, the apartment stairway was part of the set for Orson Welles' The Magnificent Ambersons (1942), and the Central Park Zoo settings were left-overs from Astaire-Rogers musicals. Even as fog continues to lie in the valleys, so does ancient sin cling to the low places, the depressions in the world consciousness. Accompanied by organ-grinding music, a black panther restlessly prowls within its cage in Central Park Zoo on an autumn afternoon. The camera moves to the right (and also tracks backward) to reveal a dark-haired woman (with a sparkly cat brooch pinned to the left side of her trim suit) who stands on the perimeter of the caged-in area and idly sketches the pacing animal on her large sketchpad. Dissatisfied with her artistic attempt, she tears off a sheet of paper, crumples it, and tosses it into a nearby hollowed-out tree stump that serves as a trash receptacle. Her aim falls short and the round ball of trash lands at the feet of a well-dressed, handsome gentleman (with a coat slung over his shoulder) sipping from a soda bottle through a straw. [The woman with her back to the camera next to him is another of the film's major characters, Alice, although she isn't formally introduced or clearly identified.] The man points to a sign that cautions against littering: "Let no one say, and say it to your shame. That all was beauty here, until you came." Man: You won't believe this. You've probably heard it a dozen times before, but I've never known any artists. Woman: I'm not an artist...I do sketches for fashion drawings. Man: Oh. May I see it? Irena: Perhaps, Mr. Reed, you would like to have tea in my apartment? Oliver: Oh, ho, Miss Dubrovna, you make life so simple. Oliver: You looked at me in such a funny way. Irena: I've never had anyone here. You're the first friend I met in America...You might be my first real friend. Irena: That's Lalage...the perfume I use. I like it, perhaps too well. Maybe I use too much of it, living alone like this. Oliver: It's hard to describe. It's not like flowers exactly. It's - it's like something warm and living. Irena: That's the lions in the zoo. One can hear them here often. Many people in this building complain. The roaring keeps them awake. Oliver: And you don't mind it? Irena: No. To me, it's the way the sound of the sea is to others - natural and soothing. I like it. Some nights, there is another sound, the panther. It screams like a woman. I don't like that. Oh, I hadn't realized how dark it was getting. (She turns on a lamp.) I like the dark. It's friendly. Oliver: Who's it supposed to be? Oliver: Oh - King John, the Magna Carta and all that stuff. Irena: No, King John of Serbia. He was a fine king. He drove the Marmalukes out of Serbia and freed the people. Oliver: Well, why have this around? Irena: Well, perhaps you have in your room a picture of George Washington or Abraham Lincoln. Oliver: Well, what does it mean?...Why is he spearing that cat? Oliver, now her metaphoric 'King John" - a savior knight, is cued to leave by the chime of the time instrument and by Irena's glance at her own wristwatch: "Boys who come to tea can't expect to stay to dinner." They agree to meet for dinner the next evening. She smiles at him from her stairway balcony as he descends, smiling after her newfound "first real friend." Commodore C.R. Cooper (Jack Holt) asks: "You're not going in for cats, are you, Oliver?" Doc Carver (Alan Napier): "We arrive at the inescapable conclusion that our Oliver has a girl." Oliver: Not yet, but I know you'll like her. Alice: Well, if you like her, she's okay with me. Irena: (resigned) Oh, it's all right. It's just that cats don't seem to like me. Oliver suggests that something is unusual when he mentions that earlier, Alice ("that's the girl who works in our department") played peacefully with the kitten. Irena quickly suggests returning it to the pet shop and exchanging it for some other animal. I can't imagine what got into them. All that caterwauling. The last time they did that was when an alley cat got in and ate up one of my nice white finches. Animals are ever so psychic. There are some people who just can't come in here...The cats particularly, they seem to know. You can fool everybody, but landy dearie me, you can't fool a cat. They seem to know who's not right, if you know what I mean. Oh, he is sweet. He will like me very much, you will see. I like to be liked. Oliver: Couldn't have been very entertaining for you. Irena: I was watching you. Oliver: Do you love me, Irena? (She nods positively.) You know I love you, don't you? I've never kissed you. Do you know, that's funny. Oliver: When people in America are in love, or even think they're in love, they've usually kissed long ago. (She gulps and looks down.) Well? (She bites her lip.) Irena, what's wrong? Irena: I've lived in dread of this moment. I've never wanted to love you. I've stayed away from people. I lived alone. I didn't want this to happen. Oliver: But you just told me you loved me. Irena: I do. I do! I've fled from the past. Some things you could never know, or understand, evil things, evil. Now, you've told me something of the past, about King John and the witches in the village and the Cat People who descended from them. They're fairy-tales, Irena, fairy tales heard in your childhood, nothing more than that. They have nothing to do with you, really. You're Irena, you're here in America. You're so normal you're even in love with me, Oliver Reed, a good plain Americano. You're so normal you're gonna marry me, and those fairy-tales, you can tell 'em to our children. They'll love 'em. He barely brushes the top of her head with a kiss - and the next scene dissolves into view.